In 2014, Gary Peterson lost his life to Ataxia. 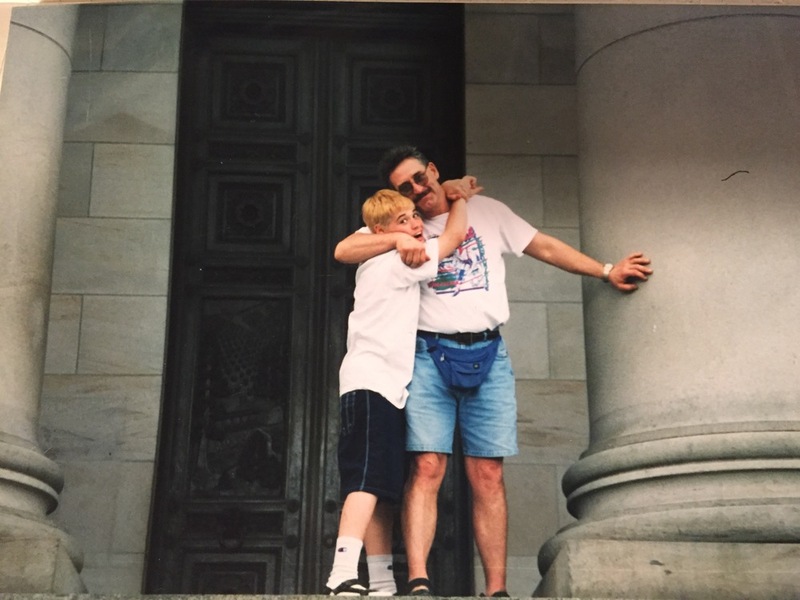 Leaving behind a desire in his son to live life courageously, like his father. To honor Gary Peterson, Trent Peterson, along with his 3 adopted mustangs traveled north continuously along the PCT (most of the time, there was some re-routing around fires and ice), a 2,659 mile long trail stretching from Mexico to Canada, in the summer 2017. Trent rode to raise awareness and money for the ataxia foundation which funds research projects to one day stop the hereditary disease. To complete this ride, Trent used Mustangs adopted, gentled and trained by himself. In doing so, he hoped to raise awareness for the challenges our wild horses face both in the wild and in holding facilities. In order to live courageously, and honor the life and opportunities that Ataxia took from Gary, Trent turned to the mountains and the mustangs. He went back to when life wasn’t as plush and so domesticated; when life didn’t exist in the borders of a fence line but ran wild across the harsh, unforgiving West. He rides to give hope to those who need some, to give a voice to those who have none and to educate along the way. He rides for Gary, he rides for the Mustangs, and he rides for the wild in us all. The Wild In Us is hosting a fundraiser ride on Saturday, October 13th for the National Ataxia Foundation. 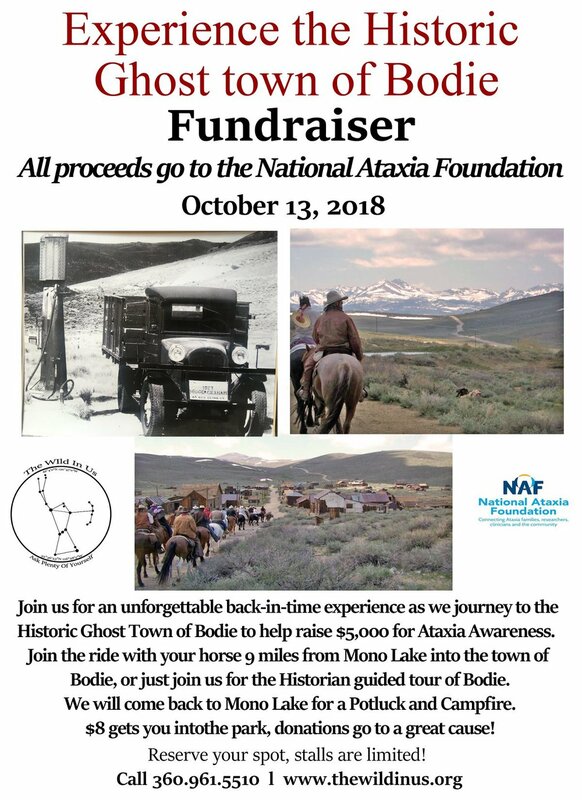 Join us as we travel via horseback back in time on a 9 mile trip from Mono Lake, CA into the Historic Ghost Town of Bodie at the Bodie State Historic Park. In Bodie, the Historian will take us on a unique tour of California's most unique Ghost Town. After the tour we will head back to Mono Lake for a potluck, campfire, great conversation and good fun. If you can't join the ride, please feel free to join us for the wonderful tour and potluck. Anyone traveling from out of town, stalls are available and limited! We hope you can join us for this back-in-time experience of a truly remarkable part of California's history. $8 gets you into the park, and any donation to our $5,000 goal is greatly appreciated. Thank you for continuing to follow this project, this goal and this story. We hope you can make it! ***All stalls are reserved, but that doesn’t mean you still can’t join us. Email or call*** for more information like meeting location and times. Find out about the ride, the mission, the man, and all of the reasons why we dedicate this ride to his cause.